Spending summer in Maine means there is no end to the list of available options to answer the question, “what’s for dinner?”. Between festivals, restaurants, family barbeques and public suppers, we’re sure to find something that will please our palates. Our family favorite is bean-hole suppers. When our children were little, our middle child Jordan, would not touch any version of home-made baked beans, but would readily eat bean-hole baked beans. I understand. I shy away from crockpot beans. Beans vary greatly in taste and texture depending on how they are cooked. Bean-hole beans, according to the Maine Folklife Center are of Native American heritage as a pre-contact food. Pre-contact foods refer to pre-colonization of the Americas and include wild game, fish, berries, corn, squash, and wild rice, depending on which part of the country was inhabited. Generally, native foods are easier to digest than wheat, dairy, and sugar as they tend to be unprocessed, less-processed, no refined sugars, not grown with pesticides or herbicides and because over the course of many generations, digestive systems have evolved based on the consumption of these traditional, native grown foods. Native American recipes for bean-hole beans were made with maple syrup and bits of fish or wild game, often venison. 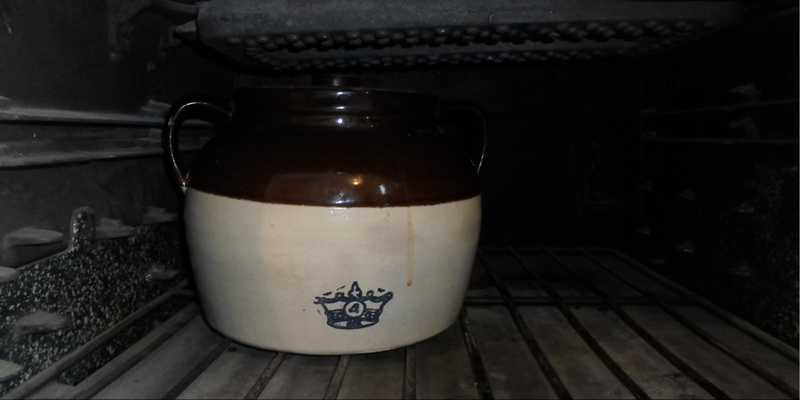 Early settlers adapted the recipe and replaced the maple syrup with molasses and later with refined brown sugar. Salt pork was added as fat to tenderize the beans and provide salt. The beans were baked in the ground in cast iron pots. New England lumberjacks adapted the tradition of baking the beans in the ground because they were not only inexpensive to make, but large quantities could be made in this manner to feed a hungry crew. 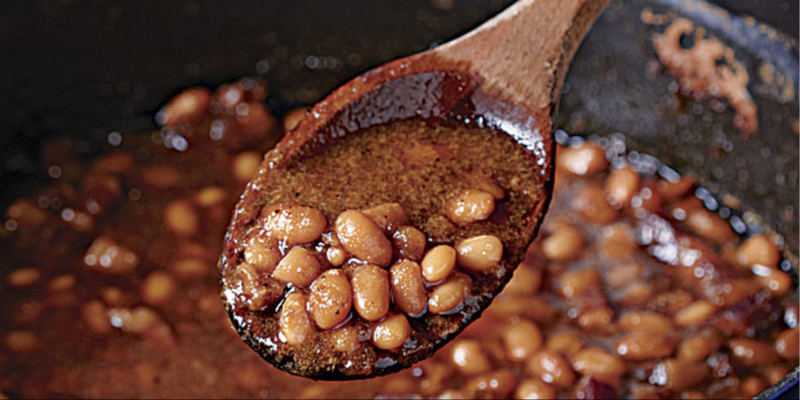 Baked beans can be made with a variety of dried beans which include, Jacob’s cattle, kidney, navy, yellow eye, or small pea beans; however, the traditional bean-hole recipe is made with yellow eye beans. Boston, nicknamed “Bean-town” adopted baked beans as a budget-friendly dinner that is high in protein, and baked in a large “bean pot,” providing enough to serve the family that night and have as leftovers through the week. The beans, which were cooked all day on Saturday, would be served cold or re-heated on Sunday when traditionally little work was done in honor of the Sabbath. Today a typical cold weather, New England, Saturday night dinner is baked beans, potato salad, hot dogs, and fresh biscuits. Dried beans will be picked over Friday night, meaning looking for stray stones that escaped processing. Then they are soaked, covered in cold water overnight. Early in the am, when I bake Saturday beans, I put them in the oven to bake all day in a slow oven. The house gradually fills with the irresistible smell of dinner in the making. According to long-time preparer, Fred O. Smith, preparations for the annual Porter Lake Strong Public Beach Bean-Hole supper, begin in the wee hours of the morning, usually, about 3:30 am. First, the previous year’s brick-lined hole is uncovered. In the hole, a fire is built and is allowed to burn down to ashes. Once the hole is readied, kettles of par-boiled beans are settled into place. 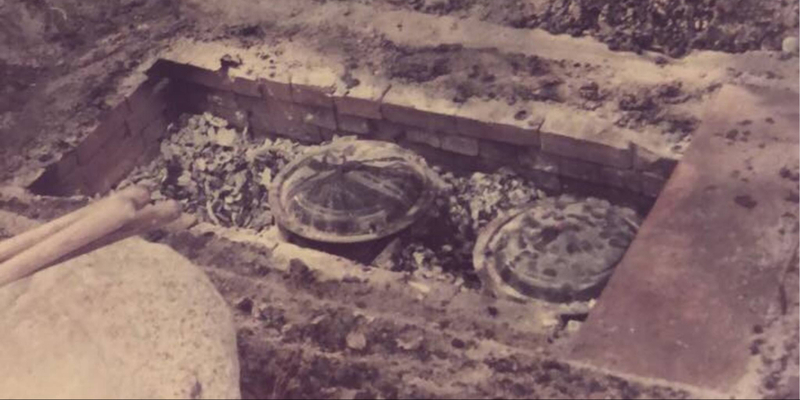 A tin is placed over the kettles, embers and ashes are shoveled on top, which is then covered with dirt. The beans bake in the ground to be ready for serving 150 – 200 attendees at 5 o’clock pm. “Ingredients for each kettle (6 canning kettles are used)”. Pick over the beans and rinse. Soak them in twice as much cold water for 6-8 hours or overnight. In the morning, the same day as the supper, bring beans to a boil for 2 hours. Beans are ready when soft, and skin cracks when blown on. Watch carefully. Add other ingredients to the kettle, bring the kettle to the bean-hole pit at the Strong public beach no later than 6:45 am the day of the supper. Arrangements can be made to have beans picked up at your home. Seemingly at the crack of dawn on the morning of the annual supper, I remember someone would stop by in their boat to gather her donation. “Now be careful,” she would admonish. “The beans are hot. Don’t spill them or you’ll have quite a mess.” There were a few times certain teenagers doing the picking up needed that reminder. The traditional Strong (Maine) Public Bean-Hole supper will be held at Porter Lake’s, Beannie’s Beach, Saturday, August 4, 2018, at 5 pm. The funds raised will be used to support Porter Lake projects, its environment, and programs. Visit their Facebook page and give it a “like”! Love bean hole beans. Used to get them on Shin Pond. So good. Hi Jean! I’m so glad you love bean hole beans. Me, too. Where is Shin Pond?